Radial or Bias Ply for a 1500 Wing? 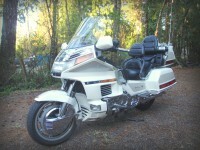 Motorcycle: Formerly 3 different Honda Valkyries, now looking at a 1200 GW. Gawd, I hope this isn't like asking, "What's the best brand of oil?" On all three of my Valkyries, I exclusively ran radial tires. In fact, unless one were to go out of brand recommendations, only radials were available from Avon, Metzeler, and Dunflop. I'm seriously thinking about pulling the trigger on a 1500 Wing... new tires are mandatory due to age. So... I see that the tire sizes are Tire – Front: 130/70-18 and Rear: 160/80-16... cool. Now I see that I've got radials and bias ply choices. What's the preference? Pros and cons? I'll be traveling limited distances (200 miles or less) as well as in town commutes and rat killing. I also see that Michelin offer MC tires for the Wing. I really like them on my Infiniti... are they the cat's meow on a bike? Re: Radial or Bias Ply for a 1500 Wing? There's no advantage I'm aware of for radials on a 'Wing. They usually cost a lot more than bias-ply tires, and don't last as long, in my experience. There are a few choices of tires for 'Wings, but not many. I think a poll would show that the majority of us are running Dunlop MT-4's. They seem to be a very large improvement on the previous (MT-3) Dunlops - quieter, less tramlining, better wet grip, longer life, etc., and the price is "reasonable". There are as many opinions on 'Wing tires as there are 'Wings, but I chose the MT-4's after a fairly exhaustive investigation into the topic. So far, I'm very happy with my choice. I was always told biased. Never questioned as to why. I used to run Michelin Pilot GT's because they were made for heavy touring bikes, but sadly they were discontinued. Changed to Dunlop E-3's after that with great results, although when they wear and the profile go's from a round motorcycle tire to a more squared off car tire it will get noisy off center. The next change will be to E-4's. Biggest things is to make sure they are properly balanced and monitor tire pressure closely. Factory recommended pressures will cause cupping it's too low. I run 40 psi. front 42 psi. rear and haven't cupped a tire since. Think I'll try balance beads this time too, although I've never had a balance issue. Anyway I'm sure someone has the bias/radial answer. ^^^Some good information there. I'd forgotten to mention pressures & balancing. I run those same pressures too, and switched to balance beads on my most recent tire installation. So far, I'm extremely impressed with the beads. They should pretty much last forever & keep the tires perfectly balanced, and they're so easy to use - put them in when you replace a tire, and just forget about them. It's that easy.